Sierra Nevada Corporation’s (SNC) Space Systems has successfully completed all in-orbit checkout procedures for the final 11 satellites in the ORBCOMM Generation 2 (OG2) constellation. The fleet of satellites were successfully launched by SpaceX’s Falcon 9 rocket during her return to flight mission at the end of 2015. 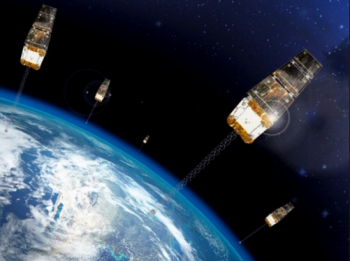 The satellites were designed and built by SNC, culminating in the transfer of operations for these satellites from SNC to ORBCOMM as part of the contract between the two companies. 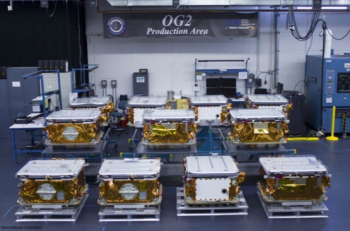 All 11 OG2 satellites have now begun to provide machine-to-machine (M2M) messaging, including Automatic Identification System (AIS) service, to ORBCOMM’s global customers. This marks the satellites entering full service. The successful launch of the satellites completed the contract between ORBCOMM and SpaceX to deploy eighteen such spacecraft. This deal was was signed in 2009. 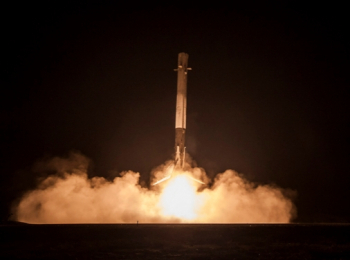 At the time of the contract signing, the satellites were expected to launch atop the smaller Falcon 1e rocket – an improved version of SpaceX’s original Falcon 1 rocket. Development of the Falcon 1e was canceled after SpaceX opted to focus on the larger Falcon 9 and carry smaller satellites as secondary payloads. The December Falcon 9 launch used three stacked ESPAs, with a further mass simulator to make the number of attachments up to twelve. 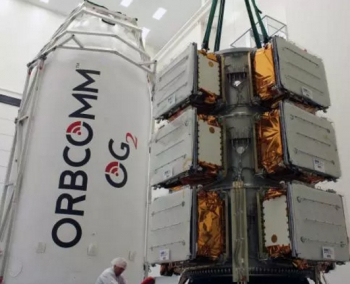 Orbcomm’s OG2 spacecraft were manufactured by SNC and MicroSat Systems, around the SN-100A satellite bus. Argon ST, which is owned by Boeing, produced the satellites’ communication payloads. Each spacecraft has a mass of 172 kilograms (379 lb) and is designed to provide at least five years’ service. Of the OG2 spacecraft previously launched, FM101 was lost in a launch failure and FM111 malfunctioned after eleven months in orbit. 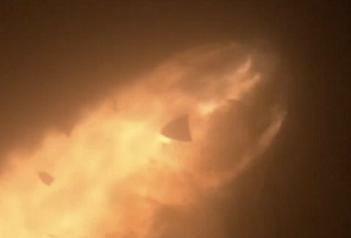 The remaining spacecraft are currently believed to be healthy. The addition of the 11 OG2 satellites via the launch of the Falcon 9 resulted in huge media interest, as the SpaceX rocket returned to flight and successfully deployed the satellites – all while there was a lot of attention was back on the ground, as the first stage conducted the first successful return. The first stage returned to the Landing Zone 1 site at Cape Canaveral and has since been fired up via a short static fire as part of SpaceX’s reusability aspirations. The stage is currently housed in SpaceX’s Horizontal Integration Facility (HIF) at its 39A launch site at the Kennedy Space Center (KSC). For the OG2 satellites, they are spaced within three separate drift orbit planes and the OG2 satellite fleet is now processing more than 60 percent of ORBCOMM’s M2M traffic. Drifting will continue until all 11 OG2 satellites are in proper phase. However, Monday’s announcement marked the end of SNC’s role with the early life of the new birds. “SNC is pleased to have completed the hand-off orbital operations of the final satellites in the OG2 constellation to ORBCOMM,” noted Mark N. Sirangelo, corporate vice president of SNC’s Space Systems. “All Mission 2 satellites have exceeded performance measures and our team was able to achieve that key milestone just over a month after launching. During that 30-day timeframe, we successfully completed the deployment and checkout of 11 simultaneously-launched satellites. As the prime contractor and spacecraft bus manufacturer for this enhanced communication constellation, SNC was responsible for the design, development, integration and launch support services of the satellites. SNC, in announcing the milestone, noted the key aspect to the success of launch operations and initial checkout was the seamless interconnectivity of SNC’s Louisville Satellite Operation Center (LSOC) in Louisville, Colorado with ORBCOMM’s Network Control Center in Sterling, Virginia, allowing for both engineering and operations teams to manage and monitor satellite performance during the detailed in-orbit testing. Along with SNC’s SN-100 satellite bus, which can be tailored to support a variety of applications, including communication, Earth observation, weather and space science, the satellites utilize a modular payload deck with the ability to be rapidly integrated and tested using highly-automated scripts to test all functions. This allows the baseline satellite to be quickly and cost-effectively configured to meet customer requirements.